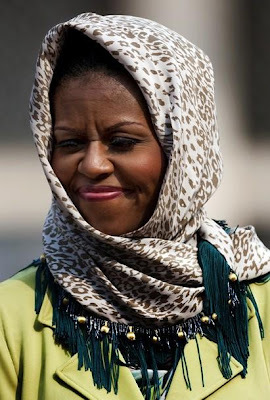 S T Y L I S H . M: Michelle Obamas' Take On Hijab Styling..
You may have already seen these photos of Michelle Obama in Hijab on a visit to Istiqlal Mosque in Jakarta on November 10, 2010. I, on the other hand, am a few months behind the rest of the world. she's pretty ugly in that head wrap. Salaam! Good to see you back. C - Wa alaykom al salam :) Well, I doubt she will be wearing anything Islamic seeing as Egypt does not have rules on how you can and can't dress. Imran - Thanks! That cracked me up, bless the fat kid :D lol. Don't care. Not an Obama fan (husband or wife).